Mission: To protect the lives and property of our citizens by delivery of high quality emergency response, education and prevention. ​Located at the Maryville Municipal Building - Entrance at W. Broadway Ave. and Gary Hensley Blvd. Scroll down this page for more department information. The Fire Department offers several training and demonstration classes for fire-related issues. Listed below are many of the opportunities in which citizens can participate. For more information, call us at 273-3650 or 273-3601. Begins October 1, the Maryville Fire Department visits every Maryville school classroom K-5 with specialized interactive activities with age-appropriate training designed to help kids be confident about what to do if ever confronted with fire dangers. Depending on resources available, we may be able to dispatch a truck to a special event. To check on availability, contact us at 273-3650 or 273-3601. Groups are welcome to tour the fire station and see first-hand how Maryville Fire Department is ready to respond. To schedule a group tour of the fire station, contact us at 273-3650 or 273-3601. Replace smoke alarm batteries at every Daylight Savings Time to ensure they will always be working. Knox Box - If you need assistance with your Knox Box (Rapid Entry System,) contact Andrew Puckett at the number above. Does Maryville Fire rescue animals from trees? Despite what the TV shows tell you, Maryville Fire does not rescue kittens or other animals from trees. A member of our fire department said, "Kittens have better climbing gear than we do." They will always come down on their own. Does Maryville Fire fill up swimming pools? Sorry, no we don't. Fire equipment, resources, and water are not for private recreational use. ​Accreditation On February 26, 2008, the City of Maryville Fire Department became an Accredited Agency. 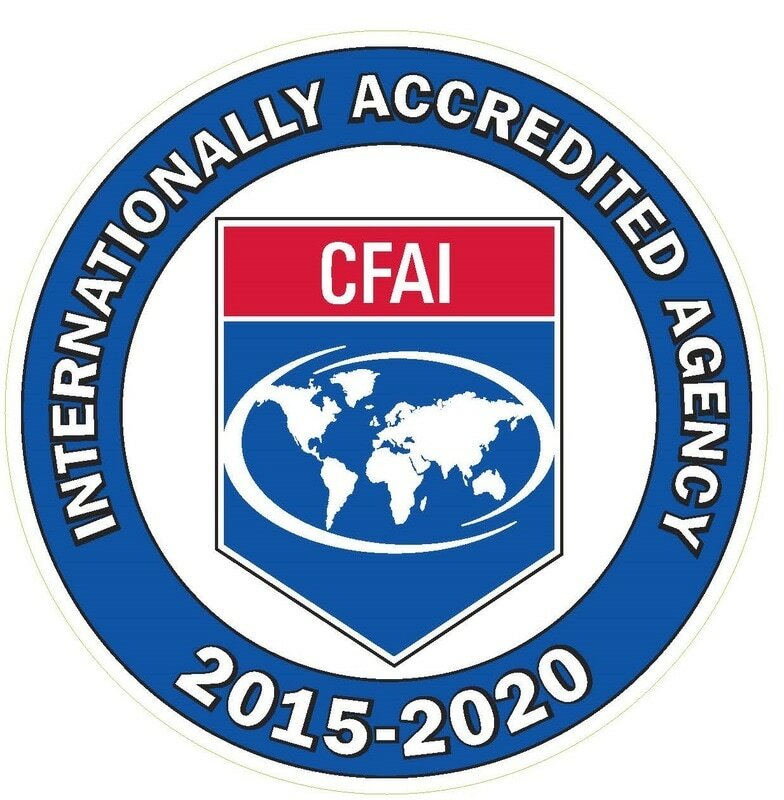 This milestone reached by the department, is under the auspice of the Commission on Fire Accreditation International (CFAI); the only accrediting agency for the fire service. The process, which took two and one-half years to complete, resulted in the department becoming the third accredited agency in the State of Tennessee and the 128th internationally. The CFAI accreditation process provides a well-defined, internationally recognized benchmark system used to measure the delivery of fire and emergency services to a community. Rewarding those who actively participate in the accreditation program, achieving excellence in service and establishing a plan for continuous improvement. ​The process includes three major components. The first, being a self-assessment as to the current condition of the agency as it relates to their ability to perform tasks associated with protecting the lives and property of the citizens they serve. This assessment requires the mastery of 244 performance indicators divides among ten core categories. The second is a detailed Strategic Plan based on current and projected needs. The five year plan allows for the construction of a “roadmap” that insures the agencies ability to achieve its mission; not only at the present time, but into the future. The last component, The Standards of Cover/Risk Assessment, involves a physical survey of structures and facilities within the jurisdiction; for Maryville this meant over 1000 specific evaluations. These evaluations are then used to determine the levels of risk present in the community. Once complete, the compiled data allows the agency to determine what steps will be involved in ensuring their ability to mitigate possible emergency incidents. Once accreditation status has been achieved, CFAI requires an annual in-depth report that ensures the benchmarks that were achieved, are maintained. After a five year period, the re-accreditation process begins, thus proving continuous quality improvement. To serve the community with innovation, responsiveness, knowledge, and professionalism. We are accountable to those we serve. We resolve to be role models in the community to take the fire department to the highest level of service through teamwork, technology, and training. To recruit and retain a well trained diversified team who are proactive in providing quality service. Provide aggressive public fire education to ensure our community is aware of the risks and to work with them to reduce those risks. We encourage change to ensure we maintain a high level of development in operations, training, wellness and education. We are committed to community involvement and shared leadership to develop innovative thinking and effective communication at all levels of service to our members and our community. To protect the lives and property of our citizens by delivery of high quality emergency response, education and prevention. PBS Star SteveSongs, with the help of Sparky the Fire Dog - Escape Plan! Download the escape planning grid here!